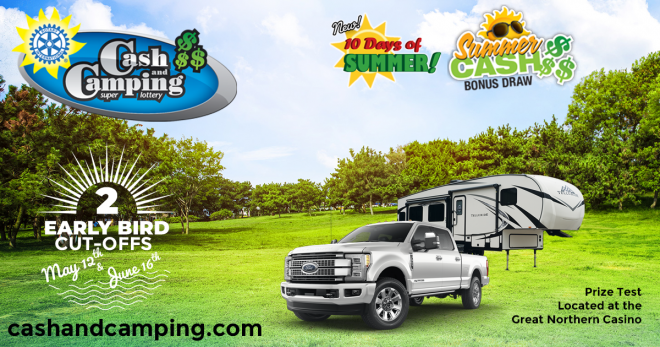 The Cash and Camping Lottery is back! Published on April 15, 2019 at 12:00 am . Grande Prairie, AB, April 15, 2019 – Don’t miss our first ever Loyalty Prize! – Deadline is May 1st. Buy your tickets today, and you will be entered to win $10,000 just for buying early! Your ticket will also be entered to win Five amazing trips including two Early Bird Prize Packages, The Grand Prize Truck and Trailer and much more! A Total of over $445,000 worth of prizes! NEW FOR 2019 – 10 Days of Summer Lottery. 2 New prizes given away everyday for 10 days! Plus, don’t forget your Summer Bonus Draw Tickets – winner takes home half up to $175,000 CASH! For 20 years we have been raising money for many local non-profit groups in Grande Prairie. 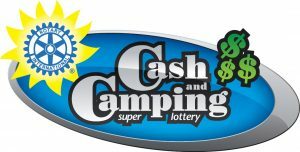 We are very proud to announce the 2019 Cash and Camping Super Lottery’s Partner Groups that will benefit from your generous support! These 8 non-profit groups are very important to us. To Learn more about them please visit here. We need you to be the voice for our most vulnerable! Published on March 25, 2019 at 11:00 pm . This is your chance to influence positive outcomes in the lives of abused children living in Central Alberta communities. Our service area extends well beyond the city of Red Deer and, since opening 16 months ago, we have provided support to over 460 children in 55 communities. Your communities. 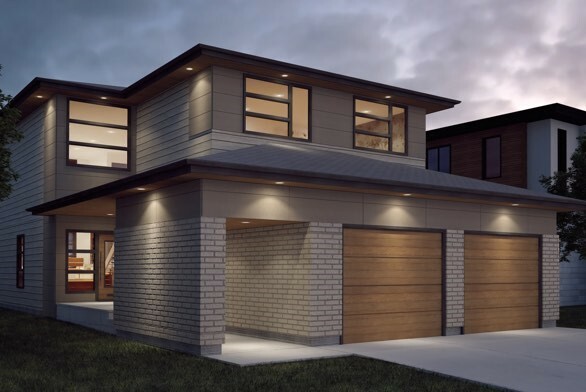 The Central Alberta Child Advocacy Centre Dream Home Lottery offers over $1.8 Million in prizes, including the $1.5 Million Dream Home built by Abbey Platinum Master Built. Additional prizes include a 2019 Cadillac XT4 Luxury AWD, a 2019 Toyota Corolla and a signature diamond ring, just to name a few. In addition to the main lottery, there is also a Split 50 raffle with the winner taking home $500,000 if the raffle sells out. Take a look at our entire prize line-up HERE! Tickets for the Dream Home Lottery are available at only $35 each, with packaging options of 3 for $75, 8 for $150 and 15 for $250, while the Split 50 tickets sell at $10 each, 10 for $25 and 25 for $50. Buy Your Tickets Today – order online at cacaclottery.ca, call 1-833-475-4402, or visit our Dream Home located at 57 Larratt Close, Red Deer. Deadline to purchase tickets is 11pm April 7, and the final draws will be held on April 17. Don’t forget your Split 50 Cash tickets – winner will take home up to $500,000 CASH. Click here to check out the current jackpot! The centre is comprised of a collective that is driven by the courage to support children, youth and their families affected by child abuse, enabling them to build enduring strength and overcome adversity. It takes courage to come together as a community to bring child abuse to the forefront, giving voice to a difficult issue that is often silenced. Click here to learn more. Follow the Centre on Facebook & Twitter. This year’s lottery is over 98% sold! Published on March 19, 2019 at 11:00 pm . Have you purchased your STARS Lottery tickets yet? Only 2 days left! It’s your last chance to buy STARS Lottery tickets! When you buy a $30 ticket, you’ll be entered to win over $4.5 million in incredible prizes including 2 luxury vehicles, 3 show-stopping showhomes, 5 trips of a lifetime and much more! Tickets start at only $30 each — or increase your chances of winning with 3 for $60 or 6 for $100! Buy your lottery tickets now online at starslotteryalberta.ca or by calling 1-888-880-0992. Imagine waking up in one of our show-stopping showhomes! Will you live in over 2,500 sq. ft. of character and charm in The Delcourt in Edmonton, entertain in style in The Kennedy II in Calgary or impress in a state-of-the-art chef’s kitchen in The Reece in Lethbridge? You could be turning the key to your new home when you buy your STARS lottery ticket. Wait! There are 2,806 more prizes to be won! Check out our entire prize lineup. The lottery ends soon. Our fight for life never does. Since STARS lifted off for the first time in 1985, we’ve flown more than 40,000 missions providing critical care services in life and death situations. Click here to learn more. We Need Your Help, Deadline Extended! Published on March 12, 2019 at 11:00 pm . This is your chance to influence positive outcomes in the lives of abused children living in Central Alberta communities. Our service area extends well beyond the city of Red Deer and, since opening 16 months ago, we have provided support to over 440 children in 54 communities. Your communities. Last Chance to Win over $1.8 Million in prizes! Published on March 4, 2019 at 11:00 pm . Red Deer, AB, March 5, 2019 — Since opening, the Central Alberta Child Advocacy Centre has supported over 430 children and youth from over 54 communities across Alberta. By purchasing a Dream Home Lottery ticket today, you are giving back the promise and possibility of a healthy future tomorrow for our children and our community. 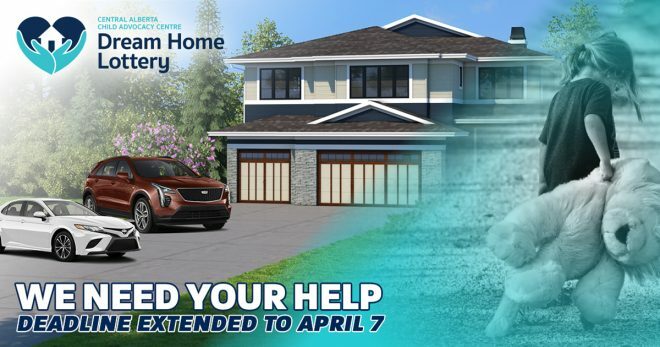 Help support the Central Alberta Child Advocacy Centre and get your chance to win over $1.8 Million in fabulous prizes, including the fully furnished Abbey Platinum Dream Home valued at over $1.5 Million. Other prizes include a 2019 Cadillac XT4 Luxury AWD, a 2019 Toyota Camry, a signature diamond ring, fuel for a year, groceries for a year, and so much more! Tickets are only $35 each – or increase your chances with 3 for $75, 8 for $150, and 15 for $250! Buy Your Tickets Today – order online at cacaclottery.ca, call 1-833-475-4402, or visit our Dream Home located at 57 Larratt Close, Red Deer. Click on the image below to see our gallery and virtual tour! The Central Alberta Child Advocacy Centre is dedicated to nobly protect the innocent and vulnerable. We understand that the best way to a healthy future is through the protection of today’s most innocent and vulnerable, our children. Win over $1.8 Million in prizes! Published on February 26, 2019 at 11:00 pm . Red Deer, AB, February 27, 2019 — Since opening, the Central Alberta Child Advocacy Centre has supported over 430 children and youth from over 54 communities across Alberta. By purchasing a Dream Home Lottery ticket today, you are giving back the promise and possibility of a healthy future tomorrow for our children and our community. Published on February 11, 2019 at 11:00 pm . Red Deer, AB, February 12, 2019 — Don’t miss out on the chance to win over $1.8 Million in fabulous prizes, including the fully furnished Abbey Platinum Dream Home valued at over $1.5 Million. Other prizes include a 2019 Cadillac XTR, a 2019 Toyota Camry, a signature diamond ring, fuel for a year, groceries for a year, and so much more! Published on February 5, 2019 at 3:39 pm . EDMONTON, AB, February 5, 2019 — If you haven’t checked out the complete list of winners in the 2018 Mighty Millions Lottery, now’s your chance. Winning the $2.4 million Grand Prize Showhome, plus $100,000 cash, was Teneesha Levy, of Spruce Grove, with ticket #039708. The 50/50 winner, Jodi Otto of St Albert, won $566,000 with ticket #750814. 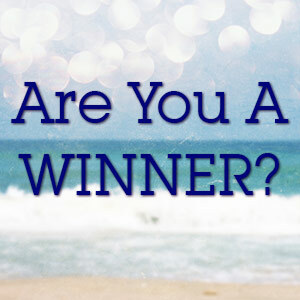 See the article for major winners, a link to the Mighty Million Lottery’s complete list of winners, and the opportunity to leave us some feedback. Published on January 9, 2019 at 11:00 pm . 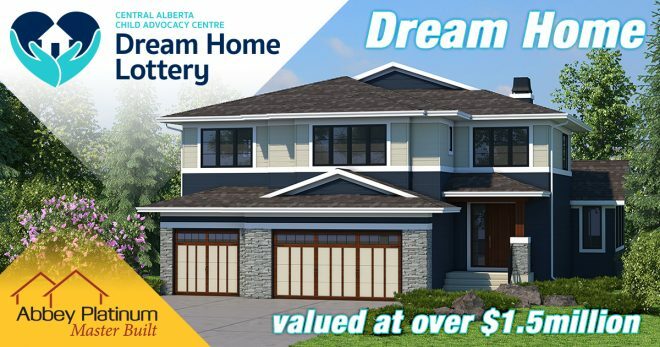 Red Deer, AB, January 10, 2019 — Someone is going to be the very first winner in the Central Alberta Child Advocacy Centre Dream Home Lottery, and we want it to be you! Buy your tickets before 11pm on January 15 to be eligible for the early bird cash prizes of $10,000, $25,000, and $50,000! Your ticket will also be entered to win over $1.8 Million in prizes, including the fully furnished Abbey Platinum Dream Home valued at over $1.5 Million. Don't Miss the Grand Prize Deadline in the New Carya Cash Lottery! Published on December 12, 2018 at 9:00 pm . Calgary, Alberta, December 13, 2018 — Will you be the very first grand prize winner in the carya cash lottery? Buy your tickets today for your chance to win the $15,000 grand prize. The deadline for ticket sales is December 21st at MIDNIGHT, so don’t delay! Tickets are only $25 each – or increase your chances with 5 for $50, 10 for $75. 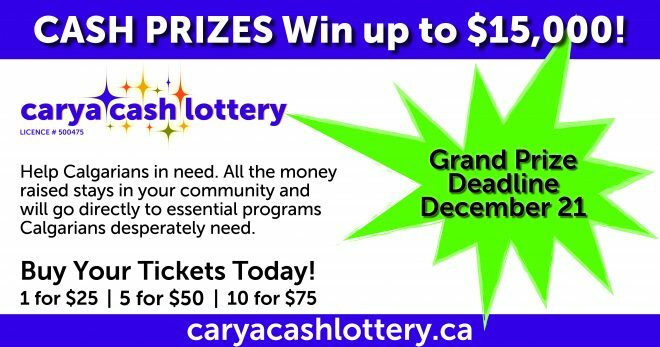 Buy Your Tickets Today – order online at caryacashlottery.ca, or call 403.269.9888. For over 100 years, carya has been positively impacting the social fabric of our community. We tackle issues like poverty, abuse, violence, neglect and more at their root causes, and step in to help in times of crisis. From new parents and babies, to youth and families, to older adults and isolated seniors, we help build each person’s capacity to deal with life’s challenges, thereby impacting the whole network within which they move. We have a passion for seeing lives changed, families healthier, individuals more resilient and communities stronger. Each year, we offer over 40 programs that serve more than 40,000 Calgarians, creating the following outcomes and impacts. Click here to learn more about the amazing programming carya offers.